State Senator in Connecticut wants review of bus regulations after deadly crash during trip from CT to NY. A Connecticut lawmaker wants to make sure the state is doing enough to protect passengers riding on buses. 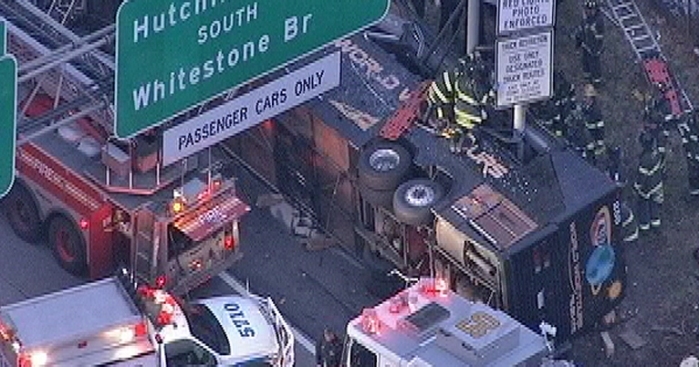 In the wake of a bus crash early Saturday morning that killed 15 people traveling from Mohegan Sun to New York's Chinatown, State Senator Robert Duff, D-Norwalk, is calling for a a comprehensive review of the state's safety regulations, reports The New Haven Register. "We see these buses going up and down our roads all the time. Where we can improve safety. we need to do so and we need to work with our regional counterparts to affect change as well as lobby for change at the federal level," Duff told The Register. The bus driver, Ophadell Williams, told police that a tractor trailer clipped the bus, causing it to slide off the road and hit a sign pole on Interstate 95 near the Hutchinson Parkway. Police are treating the wreck as a criminal investigation. However, passengers say that doesn't match up to what they felt and saw. Some said Williams had already swerved at times to the right for no reason before the accident, a law enforcement official told the Associated Press on condition of anonymity. Passengers also said they didn't feel anything hit them. Williams was released from the hospital on Sunday night and hasn't commented publicly. The National Transportation Safety Board plans to analyze three devices: a camera mounted in the bus facing the passengers; an engine control module, which may tell how fast the bus was going; and a GPS tracking device from the tractor trailer.